Difficulty finding the right placement for your child? Tip-Top Tutoring created a comprehensive program for students that do not receive the appropriate support from public schools but are not challenged enough in private schools for students with disabilities. Please click on the link below for more information and to find out how your child's tutoring costs may be covered by a grant. 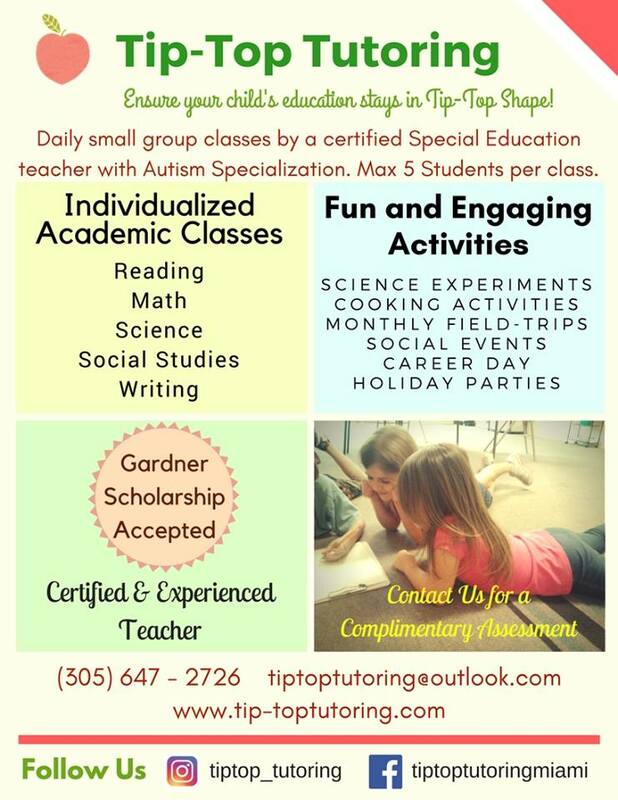 Tip-Top Tutoring offers a variety of classes for homeschool students in grades Pre - K - 6th grade. We are currently taking applicants for daily small group tutoring as well as weekly Science and social skills classes. Science classes include a Science experiment or hands on activity each class. Click here to see what makes our homeschool program unique. Tip-Top Tutoring is able to teach at students' homes for homeschool students completing at least 12 hours of tutoring per week. Parents and tutors work together to select the best curriculum for the student and create a daily schedule. Classes are taught in a fun and hands on way by a certified teacher. All homeschool students that have received individual tutoring have shown signigcant gains in a short period of time. These students are also encouraged to join all other Tip-Top Tutoring students for field-trips and social activities. Tip-Top Tutoring understands that some parents prefer to teach their children themselves. We would like to support those parents to help them provide a complete, organized, and fun educational experience for their children that meets all state and national standards. We will guide parents through curriculum selection, teaching ideas and strategies, planning, and scheduling. Tip-Top Tutoring provides state mandatory yearly evaluations to homeschool students at their home, a public place or at our tutoring center. We also provide standardized tests given individually or in small group settings at the student's home or at our center.